This Saturday, like all Saturdays, the Darjeeling Café will be busy and awesome with a few bands and lots of affordable suds and great wine. People love spending their Saturdays with us at the Darjeeling Café. This weekend, they'll have to pay 4 smackers to do it, but that's uncommon. We usually supply the space for free. We don't like being all Cohagen about it, but sometimes air's in short supply. And the core of Mars is made of ice. This Sunday, the actors of the American Shakespeare Center are putting on a concert. I will be there. It will be fantastic. Our actors (most of them) are also great musicians, and an acoustic concert at the Blackfriars Playhouse is a great way to ring in the spring. I really wanted to see a movie this weekend, but I am broke and don't even have enough money to buy a ticket. Working in the non-profit arts world is rewarding in many ways, but not financially. So I probably won't catch Ghost Writer. I think I'd like to rent some DVD's and watch them. But the weekend's pretty full. One more highlight is band practice, which I look forward to very much. 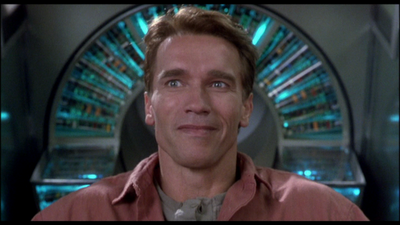 I'd really like to watch Total Recall, though.